Salads are definitely healthy, but they don't have to be boring, like what most people think! 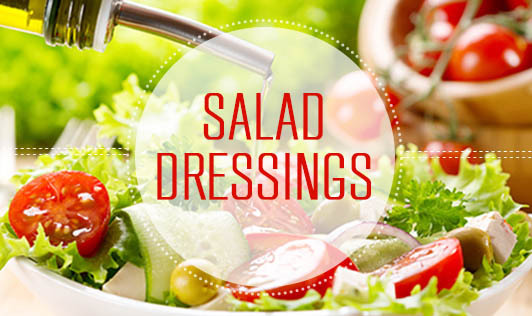 Salad dressings help in bringing out the flavour of the vegetables, and in some cases, enhances absorption of certain nutrients too. In order that a salad dressing is healthy, one needs to avoid the use of ingredients like mayonnaise, cheese etc, else the whole purpose of eating salads is lost. Find some salad recipes below that will make your salad delicious and healthy. • Mix all the ingredients together and keep it refrigerated till serving time. Note: You can use curd instead of buttermilk if you prefer a thick, creamy dressing. • Mix all the ingredients and shake well. • Keep aside for at least 1 hour before serving. • Pour it into your choice of vegetables or pasta and serve. • Keep it refrigerated till serving time.